This course explores the new directions schools and districts are taking in designing and implementing flexible world languages programs. It creates a new framework for the value of language learning and for designing world language curriculums that use assessment targets. It discusses issues of instructional environments along with the roles of teachers and curriculum with performance based approaches. Setting various realistic expectations for student's second-language proficiency are also presented. Educators will also research various issues regarding world language instruction as well as develop lessons for classroom implementation. Teachers will examine the shift to performance-based model of language instruction programs and the challenges associated with new instructional activities, projects and academic assessments. 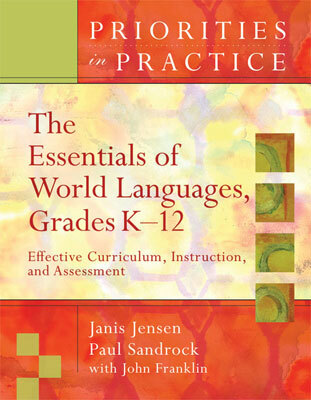 Students will learn about setting more realistic expectations for attaining student's second-language proficiency using a variety of instructional approaches. Educators will be presented with new ways to arrange the instructional environment in languages classes as well as creating a new framework for the value of language learning in an increasing global social culture. Teachers learn about designing curriculum and corresponding assessments. They will review current research in the field of world languages and design new lessons and classroom strategies. Educators will review the new techniques and concepts that are being developed by teachers nationwide for possible implementation into their instruction.